Tinkers were the traveling tinsmiths of yore, and are often conflated nowadays with Tinkerers. Tinkerers are America's darlings, an allegory gone all rumpled shirt. Their emissions, however, are not for the feeble of heart. Familiar objects and parts are stacked in the corner, lit on fire, garbled via the transmitter, stuffed in a backpack, glued to something else - this is how the best of things begin. In Jack Hitt's book Bunch of Amateurs, he writes that if you are today's tinkerer, or maker, you are adept at, "setting aside of all presumptions that you have, and look(ing) at something as if you've just seen it for the first time." (The Lab, as you all know, drools over this idea.) Throw it all out the window, throw it at the wall, throw the baby out with the bathwater. If you're a tinkerer, you're ok with less specialization, give much more interesting answers to the "what do you do?" question at parties. For one: Thomas Jefferson invented household tools, studied animals, fossils, and botany. While dabbling in theology, he "cut all the miracles out of the New Testament because he thought Jesus made a whole lot more sense without the supernatural material mucking up the good moral philosophy.” On the side, he helped run the country. 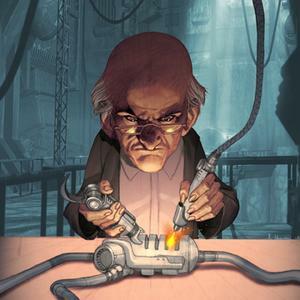 If you were a great tinkerer of his time, you maybe swore a lot. A tinker's damn, as far as Victorian cussing went, was of little significance, as tinkers were reputed to curse so freely and often. Similar to a hoot, no real harm came of not giving one. If you were to be a great tinkerer of any era, you might also want a garage. Mike Nesmith's mom's White Out: perfected in a garage. And out of garages, many other ubiquitous things came ...the song Louie Louie, The Kinks, Credence Clearwater Revival...Google, Harley Davidson, the Maglite company. The first modern garages appeared in the 1920's, but it was the post-war 1960's garages that were attached to the house, and ripe for slip-out-there-late-at-night work sessions. Before the 1920's, inventors had been relegated to their carriage houses, alongside the horse and buggy. Alexander Graham Bell set up his first lab inside the carriage house behind his father's home in Washington, D.C. And back in the mid-1880's Guglielmo Marconi started conducting experiments in his father’s home (garage?) in Pontecchio, Italy. He was soon able to send wireless radio signals over one and a half miles. By 1896 he held the world’s first patent for a system of wireless telegraphy. Homegrown, garage-blown things can blossom into world-changers. In The Savage Mind French anthropologist Claude Lévi-Strauss called tinkerers "bricoleurs," said they employed the characteristic patterns of mythological thought: in contrast to engineers' creative thinking, which moves from goals to means, mythical thought re-uses available materials to come up with new, innovative solutions. Following up on this idea, philosophers Gilles Deleuze and Félix Guattari, in their 1972 book Anti-Oedipus, said bricoleurs follow the classic patterns of the schizophrenic producer, one who is uncertain of what is real, and instead follows his/her own notions. Exciting. A little off key. Like the tinker-y Tom Waits tune. Have a good weekend, all, in garages big and small.